The purpose of the Craft Brew & Sausage Fest is to raise funds for the preservation and restoration of the historic Liederkranz, one of Downtown Grand Island’s most prominent landmarks, by bringing together a cultural offering of regional craft brews and meats as an event intended to benefit the whole community. Grand Island was still an unincorporated village when some of its founding fathers formed the Liederkranz Society in 1870, thereby securing its legacy as the oldest social organization in town and perhaps in the entire state of Nebraska. While Germen settlers solidified the institution as a social music and choir club, the premises quickly became a central hub for the community, due in part to its location in the heart of the fledgling town’s center. With the construction of its original hall in 1871, all manner of activities were held at the Liederkranz, such as performances, carnivals, conventions, seminal business meetings and civic functions, including voting and the signing of treaties with Native Americans. The demand for the premises was so great that a larger stage was added just nine years later in 1880. But it wasn’t until 1911 and 1912 that the present incarnation of the Liederkranz was erected. By the time it was renovated in 1963, and again in 1969, the club’s dining and dance halls were the hot attractions in town, with lines regularly stretching down the block and people cramped into the downstairs dining hall, lounge and bowling alley. Many parents and grandparents of the town’s current residents celebrated their weddings in the Liederkranz’ one-of-a-kind courtyard, a rare jewel in downtown Grand Island, or witnessed prominent events there. However, by the 1980s the club’s popularity had waned and it faced financial catastrophe. It is only thanks to the rescue of a small group of dedicated volunteers that the building has remained partially open and its historical relics intact. Despite their best efforts, much of the building needs renovation and repair. 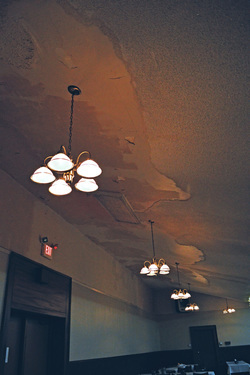 Outside of updating decor, the ceiling in the dance hall is in desperate need of replacement, the stage needs renovation, its sound and lighting systems could use upgrading and not all of the bowling lanes are functioning. And while much of the building has been “Grandfathered” into current code compliance, it is only a matter of time before many of those elements will need addressing, which will be the biggest challenge. As a member-supported non-profit entity, the upkeep and functioning of the facility falls on the shoulders of a core group of a few dedicated volunteers. In order for this gem to do more than just survive, it will take a community to bring it back to glory. As the Liederkranz once provided for Grand Island, it is time for the city to help this crucial community landmark. A Capital Improvements Fund has been created to facilitate rejuvenation of the building with dedicated contributions. 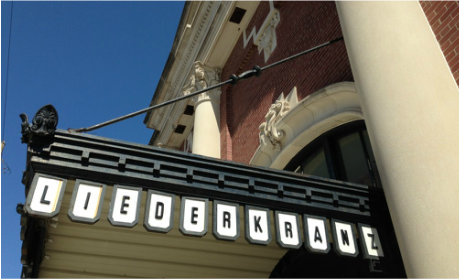 In turn, a rejuvenated Liederkanz could fill a gap in Downtown Grand Island, as a venue space that could host attractions that could bring more people to the district and its businesses, and the city as whole. The first effort toward that goal will be the inaugural “Craft Brew & Sausage Fest,” an event organized by downtown enthusiasts who hope it will act as an annual draw to the city center and its offerings. It will feature regionally-crafted beverages, meats from local butchers, eclectic music and other fun festivities in the spirit of Oktober Fest, all under the beautiful canopy of the trees in the Liederkranz’ enchanting courtyard.